When I pulled back the curtains this morning before 7 o’clock the sun was shining and the day looked great. But how quickly that changed! The sky began to cloud over and the light breeze turned into a very strong wind. 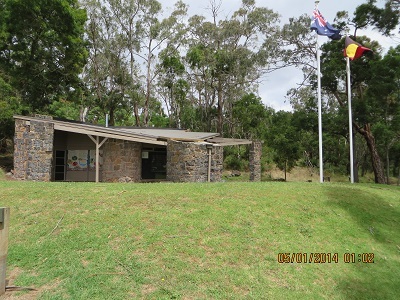 We set off for Mt Eccles National Park and aimed for the South Western section which I thought would be a bit quieter. I need not have worried! I travelled along Woolsthorpe Heywood Road, turned left into Millards Road and right at Shamrocks Road. 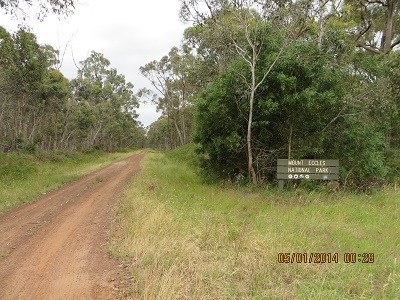 It lead to a very narrow 4 x 4 track, pretty well overgrown, so we back-tracked to Dunsmore Road travelled about two kilometres to a small clearing where I set up my portable station. I was on the air at 23:03 and called CQ. I was immediately answered by VK2XJM/p5, Josh, who was on SOTA summit VK5 SE 013. 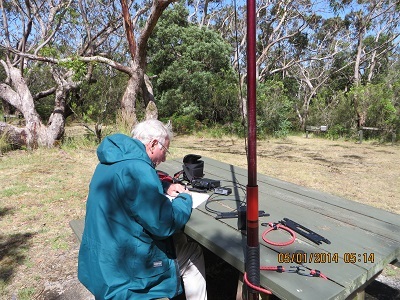 I then had contacts with VK5KGP, Graham; VK5LY, Larry; VK3YSP, Joe; VK7NWT, Scott at Boat Harbour; VK3AMB, Bernard; VK3MTB, Tim; VK3FOWL, Julie; VK3NAD/QRP, Peter; VK3ZPF/p, Peter in Chiltern – Mount Pilot National Park; VK5PAS, Paul; VK5AV, Tim; VK2UH, Andrew, Yass; VK5DJ, John; VK5EE, Tom; VK5FTRG, Tom; VK5NRG, Roy; VK5FMIF, Brian; VK5NIG, Nigel; Vk3AFW, Ron; VK5HCF, Col; VK3TKK, Peter; VK3FB, VK3AMX, Alex and VK3SOG, Fred. I thought 25 contacts was a pretty good start for the day. As I was packing up down came the rain. And the wind picked up to gale force strength. We got in the car and thought well we might as well give it away for the day. We drove around to Lake Surprise but it was too wet to take photos. After lunch in one of excellent shelters we decided to take a different track back to Portland. 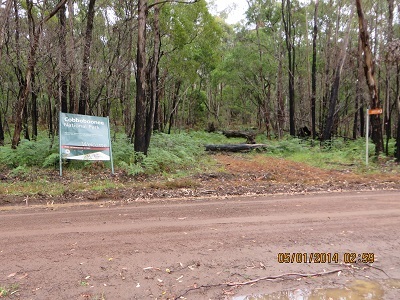 We took the Wood, Wine & Roses Forest Drive which crosses Victoria’s newest national park, Cobboboonee. Some of the roads were very slippery and four wheel drive was engaged on some of the secondary tracks. 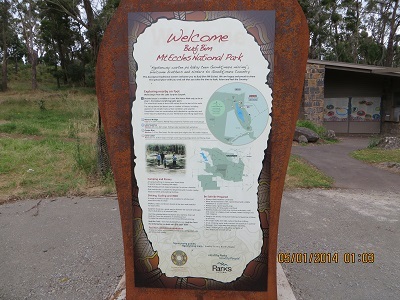 When we arrived at Surry Ridge Picnic & Camping area, the sun had emerged and I thought it was worth an activation of this most impressive park which preserves bushland. I called CQ on 7090, after checking that the frequency was clear, and was answered by VK3YSP, Joe. Then followed VK3ZPF/p, QRP, Peter at Warby Ovens National Park; VK5CZ, Ian; VK3VTH, Tony; VK5FMID, Brian; VK3MTB, Tim; VK5PAS, Paul; VK5LY, Larry; VK5EE, Tom; VK3SOG, Fred; VK3FMPB, John; VK7ALB, Peter and VK2HRX/p, Compton on SOTA summit VK2 SC 012. Thirteen contacts and down came the rain! We travelled to Mount Richmond National Park with two major objectives: the first to have a contact with VK5PAS, Paul, who was activating Mt Lofty and Cleland Conservation Park and, hopefully, to give VK3ZPF/p, Peter, a 40 meter contact with me in this park. As it turned out it was too late for VK3ZPF, Peter but I had a contact with Paul on his birthday. The first contact was at 05:12, VK3MRG/p, Marshall on Mount Dandenong, VK3 VC 025; VK3YSP, Joe; VK3FOWL, Julie; VK3FTRG, Tom; VK5HCF, Col; VK3HRA, Allen; VK5FMID, Brian; VK5PAS/p, Paul on SOTA summit VK5 SE 005 and Cleland Conservation Park; VK2FGJW/p, Greg on SOTA summit VK1 AC 035; VK3NAD, Peter; VK2NEO, Peter and, finally, VK5EE, Tom, making 12 contacts. And down came the rain!